We will be picking up our pup in 6 weeks and want to successfully introduce him to our 13 year old British Shorthair, Marley. Marley is extremely laid back, the most gentle boy which I think speak of how safe he feels with us. I would hate to upset him too much with the pup so any advice on how to make their intro/relationship as harmonious as possible would be so gratefully received. Puppy should be leashed to you when he isn't crated initially, so this will be easy. Make sure Marley has a room where he can hide - one that the pup cannot access. Keep Marley's food and water bowls in here, as well as some of his stuff (cat tree, some toys, a bed, etc). Make sure there's a gate across the door or a small cat flap in the door so Marley can duck in there whenever he wants. When Marley and pup are in the same space, work on redirecting your puppy away from any sort of chasing behaviors. As I said, pup should be leashed, so this will be easy. Give a "LEAVE IT" command, and pull pup toward you. Have something high value (treat or toy) to give pup to show he did the right thing by coming to you. dobebug and Louise&Aaron like this. Be prepared for this to take a while. Mine would revert from time to time, especially during heats. The only thing that really stopped her from chasing him was a solid leave it. Since he's also an old man (16 or so), his safety was my highest priority in all their interactions. We are willing to give it time....we will not let the pup upstairs and will have a stair gate either at the kitchen door or bottom of the stairs. Marley will be able to get upstairs without the Dobie getting to him. We are getting a Male Dobie so the heat issue won’t apply but I expect the “Male” characteristics will also be a challenge. I work from home the majority of the time but when I am out visiting customers the Dobie will be crated. The cat will also need a place or two up high that the pup can't climb to, in every room they'll be in together. The cat can escape to that refuge if needed, but it will also be a place where he can observe what is going on without fear of being in danger. For a cat, being able to watch the obnoxious stranger from a safe place is an important part of getting him comfortable around the puppy. If anyone needs to be put away (in a crate, or safe space) to calm down a particular situation, it should be the puppy. But you shouldn't lock them away in separate areas of the house as a routine. "Ahh, the puppy's out; lock the cat up in the bedroom" No! Both the cat and the puppy need to be involved in the daily life of the household. The more chance each gets to observe the other without being able to actually reach him, the better. Obviously, supervision is a must. Which, hopefully, you'll be doing with your puppy whenever he's at large anyway, to work on his housebreaking and house manners. Last edited by melbrod; 03-08-2019 at 01:23 PM. Lots of gates so the puppy can't chase and the cat can easily escape. As Mel said, LOTS of vertical space so the cat can safely observe and choose to be on the puppy's level or not. Never let the puppy chase - use a leash if needed. Reward the puppy HEAVILY when the cat is present for calm behavior and teach "leave it" right away. Cat should always have a no-puppy room with food/litter box so the kitty can eat and use the box in peace. Some really fantastic advice everyone keep it coming! Thanks so much, you are making me relax a little more about it now. knows that and if he ever forgets, he will be reminded. 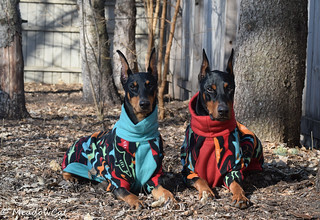 Our Dobermans helped raise our last litter of Brits. Lots of good advice you have gotten already. 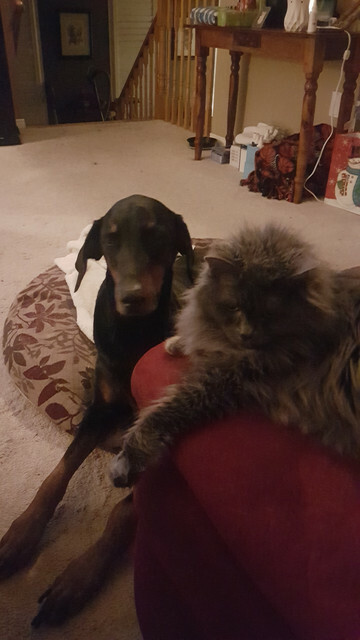 I'm in the same boat as you will be but my cat is 17 and just lived with a dobe for the last 10 years so I like to say she is dobe savvy lol. 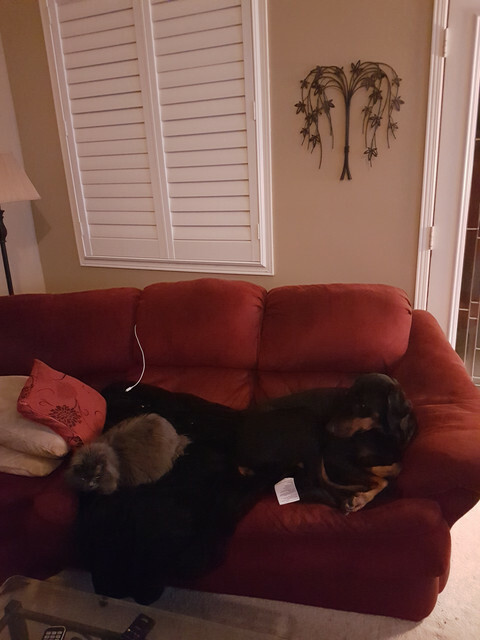 My cat has always had the basement as her refuge as our last dobe never went into the basement. I'm making sure that Sugar also does not go in the basement so Tiki has her safe space. Tiki also sits up in high spaces and watches Sugar. He has been pretty good with her because Tiki is not afraid of him as she already went through this and the last few years ending up laying with Coco a lot on the couch. If I am laying on the couch with Sugar on me, Tiki will also come up to lay down with us as long as Sugar is not wiggling around too much. What was funny the other night was when Tiki got a burst of playfulness and chased Sugar around the house! It takes some time for them to live in harmony. Tiki tolerated Coco for many years but the last 2 years as they both got older was different. Tiki started choosing to sit and lay near Coco which was always what Coco had wanted lol. Coco always deferred to Tiki. The rule around this house is that Tiki is the boss. If Tiki wanted to drink out of their water bowl, she just went in for it. Coco would back up, sit down and let her have her drink.